Sarees have been a tradition in India, mostly India, and this tradition has continued for ever since. From our grandmothers to the now us, we agree sari is not really an everyday preference but for those traditional occasions, a relative’s wedding or yours, sarees have a special significance, a special place in our heart. Now sarees according to different cultures and ethnicities vary in prints and patterns. Here is today a list of some of the best Kanchi sarees along with photos that should be a must-have in your wardrobe. Therefore this festive season adorn yourself in the best of the traditional wear and flaunt yourself to the fullest. The national flag hosts within itself three distinct colors, the white in the middle leaded by the saffron and followed by the green. This saree incorporates these three pure colors that make up the Indian flag. 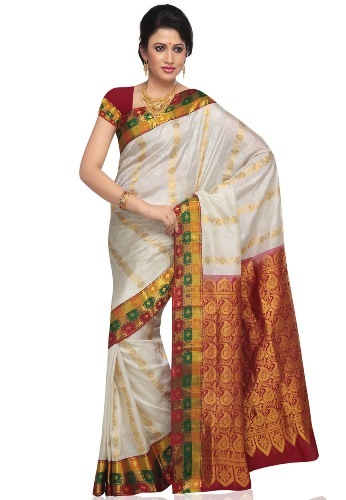 The base color of this kanchi saree is in satin white with faint gold floral work it. The side border to the saree is green with orange borderlines. It is quite common for our traditional wears to portray our culture in them. Often sarees or lehengas portray the common culture within themselves. The peacock being a national bird of our country surely got a special mention. Peacock themed sarees are often a hit amongst us, not only because of its bright well gelled colors but also because of the majestic feeling it holds. This is one of the best kanchi pattu sarees with heavy work. 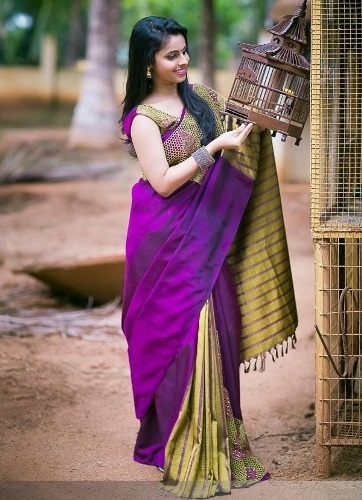 The purple and gold Kanchi Pattu saree is indeed beautiful in its humble and simple way. The saree incorporates a yellowish golden hue along with a solid matte purple and the combination we receive is simply admirable. Along the sides of the pallu towards the end, there are horizontal stripes along with a little flower show at the end of the sari. The front neck of the saree also features an embroidery embellishment made of golden on violet, which is quite the beauty in itself. Now, coming to the kind of blouse you choose for the saree to make it look good, our suggestions are one with the bi color print in the two basic colors that the saree itself is made of. Now if you are still worried about how to carry your look for the reception look no further, the heavily yellow saree comes with a body of a soft velvety canary yellow and followed by a barely there thin strip of mint green. Coming to the borderline of the saree, this saree sports a heavy embroidered zaari and georgette outer line. The saree also has a greenish tinge of border before the bigger one begins. Look at how the celebrity pulls of the corset look of the blouse she wears with the latest kanchi pattu saree flawlessly. The blouse color is no where close to the unicolor saree she is sporting, but it still looks beautiful on her and quite elegantly so. This is a great look for a traditional event where you can flaunt this beautiful saree and see heads turn as you walk by. This kanchipuram silk saree has a lethal combination of soft satin blue with yet another soft satin gold. The outer line has a strip of purple with periodical horizontal wide stripes of blue and purple down the saree. This is a perfect saree for the summers which is why this saree has been named so. The saree looks heavily beautiful with a lime green satin look and is opposed by a simply royal Prussian blue. The saree sports simple stripes in faint gold on the pallu and front but towards the end of the pallu there is an extensive art work of clover leaves and flowers. It can however get a little gorgeous on the side note, so is a good wear for wedding receptions, and is a hit quite so in the South for all good reasons. This saree is yet again another multicolored one, but the pallu has much more of a detailed network than the last one you saw on the list covered. Elegance drips from this saree as the model wrapped in this heavily embroidered Pattu poses for the photo. This is one of those beautiful kanchipattu sarees that comes in a luscious ox blood maroon red and a filthy rich shimmering gold hue. The entire saree specially the end of it is filled with beautiful golden traditional embroideries. This can be a summer noon’s delight where the white saree runs along with a golden yellow line. The borderline or par of the saree is in yellow and green with a beautiful red extensive work on the pallu. The full saree worked with some simple butas in the gap of 20 inches. The saree is beautiful in pink and golden where even the pink eludes a faint golden color. Throughout the saree there are cute creeper designs had done all over the saree and that etched on a deeper pink. As you can clearly see, teaming up the saree with an orange pattu blouse seems like your best deal in bringing out the beauty of this kanchipattu saree. 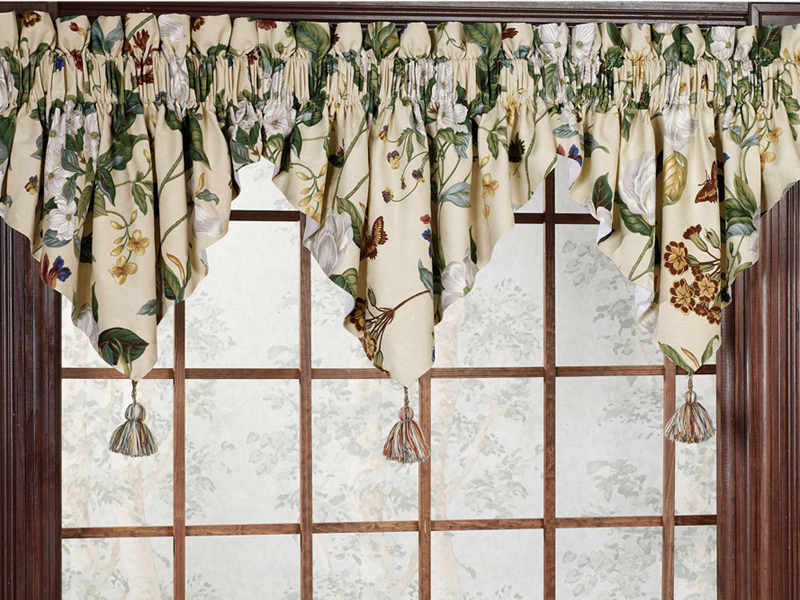 On the off white background, there are similar color faint floral designs that one might usually miss at the first go. You can choose to wear a silk blouse along as well without destroying how you look. This is one of the latest kanchi pattu sarees with beautiful colors and designs that are perfectly suitable for all your traditional functions. The saree is giving off a very classy vibe and ideal for gorgeous occasions like invitations to receptions or weddings. The golden on the saree is abundant and almost puts the red to shame by taking the place itself. The designs are different from the usual floral ones you see, but very relatable in the end of the pallu and upper chest. This half and half simple lines plain kanchi pattu saree has its own glaze to brag of. 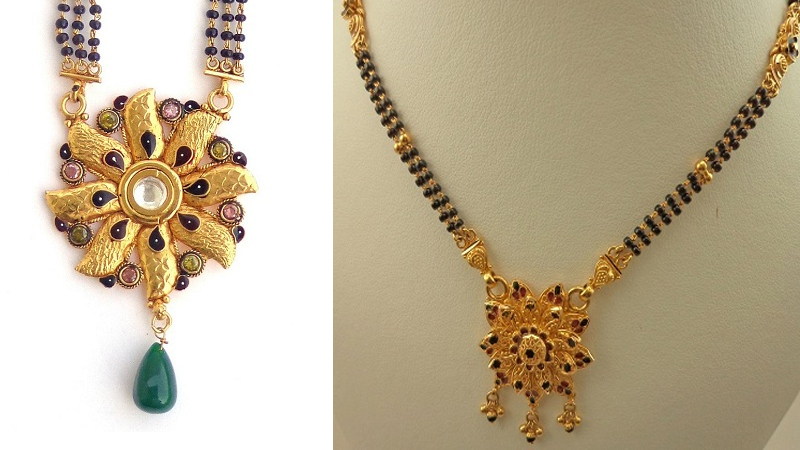 What you see here is royal violet with golden like never before in a combination. The whole saree has different designs in all essence and the pallu ends have ribbons added for extra beauty to itself. As you clearly see, sleeved blouse helps steal the show for this saree, but make sure it’s a plain blouse at all times. The saree that you see here is multicolored and who would’ve thought that the colors here will blend in so well right? The border in golden isn’t quite plain, and it has triangles all over that are adding to the charm of this classy saree. Any silk or pattu multicolor blouse will do the saree a justice to speak of. This is one of the latest kanchipattu sarees with beautiful design. The kanchi pattu saree photo you see here also features golden framework of embroidery on the red, thus bringing out its beauty all the way more. The saree can most certainly look good with a red blouse best, but golden wouldn’t be a bad idea either, but only if you run out of options for the red one to experiment with. The saree while it might look long for your usual choice, is quite chic and features a beautiful embroidery that looks so gorgeous all by itself. To make the most of this saree choose a low key blouse that doesn’t draw too much attention to itself. That said and done, every wedding season will see you emerge as the fashion queen right away. This type of kanchi pattu sarees perfectly matched for bride girl in the weddings. So, that was all there was to know about the beauty of Kanchi Pattu sarees whose images we have listed out for you. This article includes the top 15 for you to decide and choose from in the end. Happy shopping!